IFRA (International Fragrance Association) has officially issued the 48th Amendment to the IFRA 'Code of Practice' as part of the industry’s ongoing safety program. Currently, this safety program based on studying the potential effects of fragrance materials on people and the environment contains 191 ‘Standards’, which restrict, or prohibit, their use. 1. Three new Standards based on the dermal sensitization QRA (Quantitative Risk Assessment). 2. One revised Standard, based on the dermal sensitization QRA, with a corrected maximum pragmatic use level. 3. Two new Standards prohibiting use due to insufficient data for safety assessment. 4. Revised policy on combined use of four phototoxic ingredients and clarification on the application scope of all phototoxicity Standards. 5. Revised Standard on Methyl eugenol on the restriction level for non-skin, incidental skin contact products. 6. Revised Standard of Estragole on the language describing the categories (non-skin, incidental skin contact products) to harmonize with the Methyl eugenol Standard. 7. Several Standards revised for clarification. 8. Three revised Standards due to the addition of new CAS Numbers. 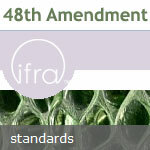 • Full details of the 48th Amendment, including annexes and guidance on implementing the Standards can be found on the Standards section of the IFRA website .